1:100,000 Scale Metric Planimetric Maps (California Department of Forestry and Fire Protection) (map G 4360 S100 C4) Series of maps at a scale of 1:100,000 on a planimetric base that cover all of California. California (Nationalatlas.gov) Reference map of California that shows major physical features, populated places and transportation routes. 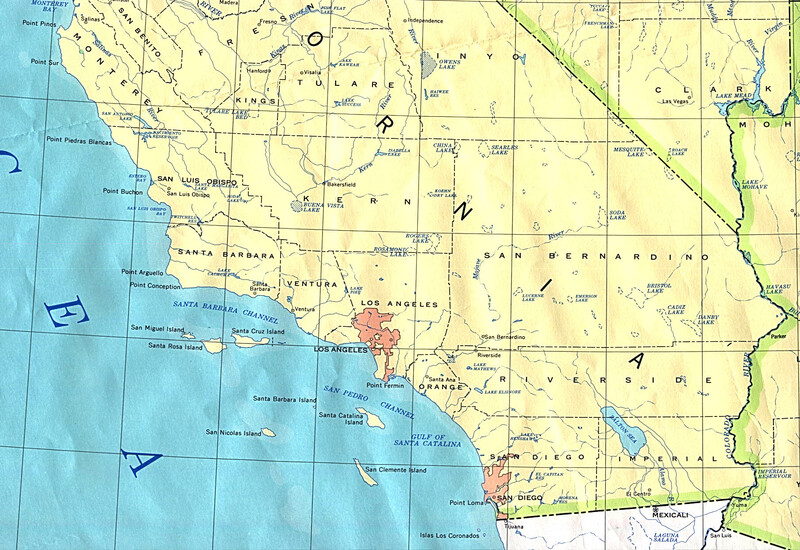 California (Northern) (Perry-Castaneda Map Library) Image of the 1990 USGS 1:2,500,000 map of California. California (Southern) (Perry-Castaneda Map Library) Image of the 1990 USGS 1:2,500,000 map of California. California State Map (California Division of Tourism) In addition to this state map there are more detailed regional maps available for viewing. Satellite Image Map of California (Geology.com) Also includes links to selected regional Landsat Geocover satellite image maps of California. Shaded Relief Map of California (US Geological Survey) Also available in black and white. Shaded Relief Map of California (US Geological Survey) Generated from the National Elevation Dataset. State of California : Shaded Relief (US Geological Survey) 1971 (map G4361 C1 1971 .G4) 1:1,000,000 scale map. State Topography Image: California (US National Geophysical Data Center) Color shaded relief image with county boundaries generated from 30 arc-second digital elevation model (DEM) data. SRTM Enhanced Blue Marble Terrain Map of California (Google Earth Library) Created by combining NASA Blue Marble imagery with the global elevation data from the Space Shuttle Radar Topography Mission (SRTM). Available as GeoPDF, GeoTIFF and Google Earth KML formats. 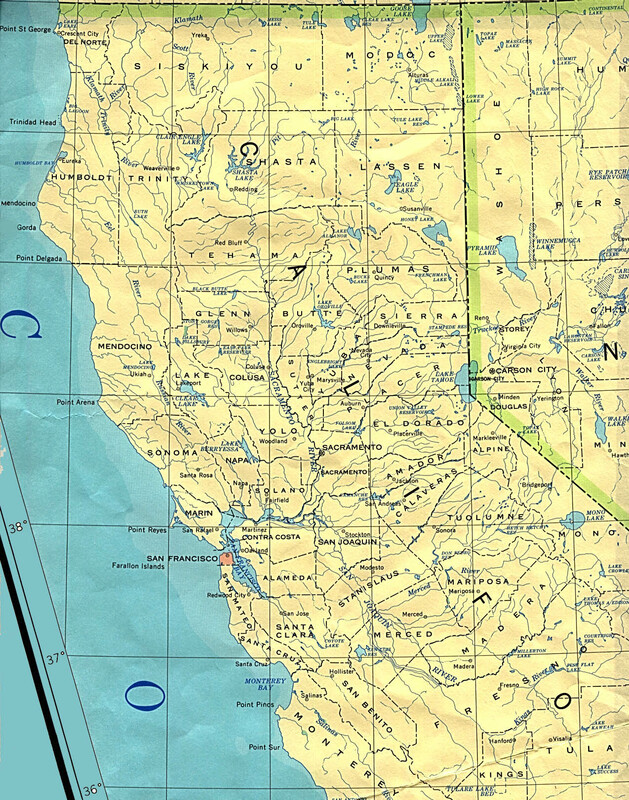 California (Nationalatlas.gov) Outline map showing California county boundaries and names. California Outline Map (Maps.com) Ouline map showing major cities and rivers. California Patterns: A Geographical and Historical Atlas (Hornbeck) 1983 (atlas G 1525 H6 1983) Appendices contain several reproducible outline maps of California. Counties (Perry-Castaneda Map Library) Image of US Bureau of the Census 1990 California County Outline Map. Draw What You Want On California Map (US Geological Survey) Outline map only has California border. 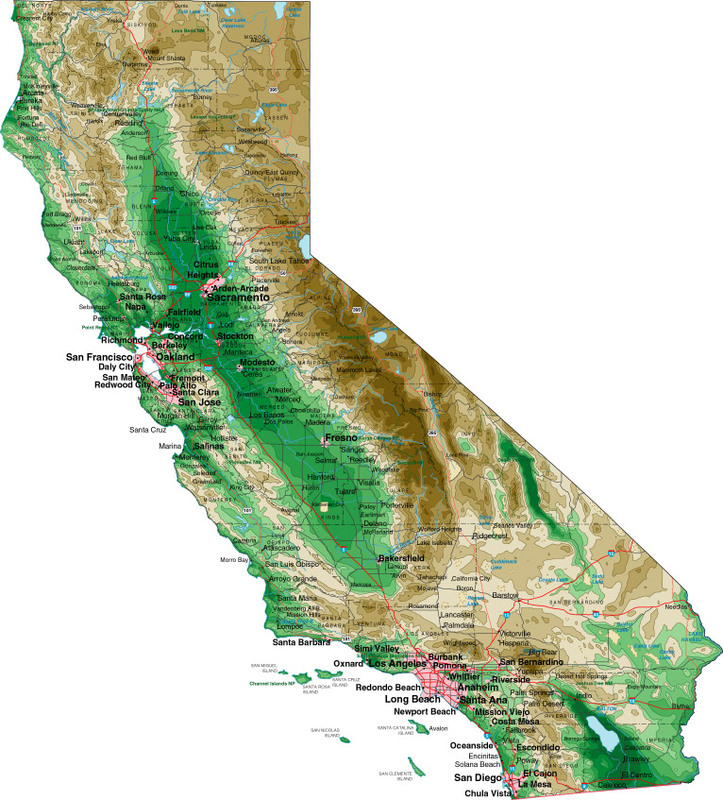 National Digital Map Library (University of Virginia Geospatial and Statistical Data Center) For California (and other states) includes the following outline pdf maps--state boundary, county boundary, major cities, hydrography, and national parks and forests. Assemby Redistricting Plan Detailed PDF Maps (California State Assemby) Maps of 2001 Assembly districts. Atlas of California Presidential Elections by County, 1932-1992 (Miller) 1995 (Atlas G 1526 F9 M6 1995) For each presidential election presents tables and maps for election results by county and political party. California Congressional District Wall Maps and California Statewide Congressional District Wall Map (US Census Bureau) Includes statewide map and individual maps of each Congressional district. California Map Series (California Voter Foundation) Contains statewide and individual maps for each Congressional, Assemby, and Senate district for both 1991 and 2002. California Senate Districts (California State Senate) Maps of Senate districts as of 2002. Congressional Districts (California State Senate) Maps of Congressional Districts as of 2002. Statewide Database (University of California, Berkeley. Institute of Governmental Studies) This is the official redistricting database for the state of California that includes both data and maps. Maps include Democratic and Republican registration by county; 1992 Presidential voting patterns at the census tract level; 2001 Assembly, Senate and Congressional district maps and 1991 Assembly, Senate and Congressional district maps.